Posted February 5, 2015 by admin . As part of our WebPresence and Social media services for our business clients, we are always looking for the best ways to build an online community for our clients. Our goal is to create posts that engage with followers, facilitate conversations, and build brand awareness so they always think of your business first when they need your services. In an effort to get the most out of your online presence and social media accounts, we have analyzed what content performs best on Facebook, Twitter, email, etc. One of our biggest findings was the performance of personal brand content on social networks and in email, versus generic content. As you can see above, the personalized post represents a specific auto shop. 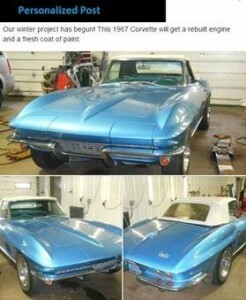 It highlights an ongoing project – rebuilding the engine of the 1967 Corvette – to show customers what is actually happening in the shop right now. 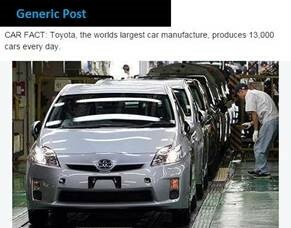 The generic post, on the other hand, relates to the auto industry as a whole. This is still valuable social media content – posts that share industry news, interesting facts, and relatable content can engage your community and achieve brand awareness. But Personal Posts do it better. Personal posts show that your company is made up of living, breathing humans who are actually doing the work, who are answering the phones, who are involved in the community, and who are creating the posts. 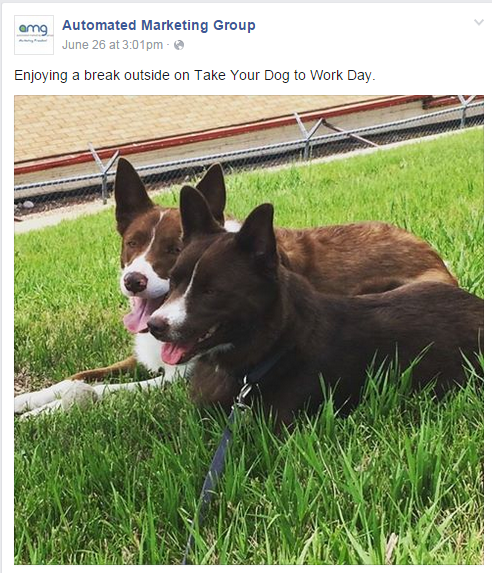 There is an EASY way to get more engagement for your online presence – personalize your posts! As you think about the next couple months, jot down any events you can think of… staff birthdays, anniversaries, community involvement, holiday celebrations, etc. We’ll do the legwork for you – let us know about these special occasions and upcoming events in your community, and we’ll find the best way you can share the news on social media. And don’t forget about pictures. Personalized pictures are a huge draw. So take out your smartphone and snap a few pictures of your company party or a balloon festival in your community. Send any photos you have of your business to socialmedia@longtermfix.com – we’ll integrate them into your individual social media plan and create unique personalized posts for your business. We want to make your online presence the best it can be, and adding a personal touch will go a long way to help build your brand personality and social engagement. Our team is available by phone at 303-703-8000 or email at socialmedia@longtermfix.com – Contact us to start creating personal, custom content for your social media accounts today, and build powerful brand awareness and lasting community engagement for your business.